Inside a grad student's apartment at the University of Pennsylvania sits a slightly faded blue-and-white wooden sign from a post office in Malone, Wash., that no longer exists. If this were any other college student's place, the sign would probably be a trophy from some kind of prank. But no: it was a gift from the post office to 25-year-old Evan Kalish, a UPenn graduate student who has crisscrossed the Northeast, driven down South and flown to Hawaii to see more than 2,700 post offices, many of which are in danger of closing or have already been shuttered. Over the past three years, he's documented the slow death of an institution that was once at the heart of small-town America, taking photos, collecting postal cards, paying tribute. Many of the postal buildings are historic, some marking the establishment of a community in a growing nation or the revival of one after a disaster. "The post office helped build the country," Kalish says. "And it's almost like they're trying to destroy themselves." The Malone post office is the only landmark listed if you search for the town on Google Maps. But it closed down Aug. 9. The next day, across the street, Red's Hop N' Market began providing limited postal services  selling stamps and fixed-rate shipping boxes alongside live worms, cigarettes and beef jerky. 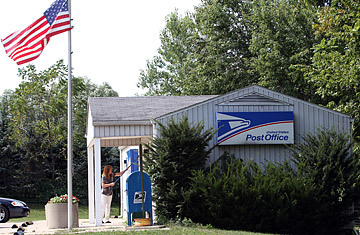 It became the first "Village Post Office" in the country and part of a strategy that the postal service is counting on to help close a massive budget gap. Resistance, both emotional and economic, to the closing of 3,000 to 15,000 post offices is growing, fueled by the objections of individuals like Kalish and mail-carrier unions which have taken out ads as part of a national public-relations campaign to save what could be more than 100,000 layoffs. But the financial situation remains dire. The U.S. Postal Service (USPS) has been sliding down an unsustainable fiscal path for years. A toxic combination of a poor economy, an increase in online bill paying, the proliferation of e-mail and other digital communication, and congressional mandates have created billion-dollar deficits for the USPS since 2007. Last year it lost $8.3 billion. This year, it lost $5.1 billion (only because a mandatory $5.5 billion prepayment for retiree health benefits was postponed). Mail volume declined 1.7%. Projected mail volume over the next decade? Down, down, down. Officials say if nothing's done, the postal service will run out of money by August or September of next year, and absent congressional action by Friday, the USPS will default on that mandated $5.5 billion payment. There are a number of plans in the works to stem the losses, including one now making its way through the Senate. Some proposals being considered would lay off 120,000 postal workers and cut another 100,000 through attrition, not to mention the recent announcement that two-thirds of all mail-processing centers will close and  the thing that has riled up people across the country the most  the closure of thousands of post offices. All told, it would reduce costs by $20 billion. "It's a race against the clock," Kalish said when asked about the fate of the small-town post offices and the institution itself. His hobby turned addiction that often has the grad student on the road from 8 a.m. to 7 p.m. many days, talking to locals, updating Google Maps as well as his blog Going Postal with images and details about each postal building he visits. "The postal service is threatening all of them. You have no idea how long any of them will be around." See how the postal service's changes will affect you.